what to do with leftovers from a few recent shoots and a pot of oil for frying? goat cheese crab wontons, yum! we try not to fry things very often but this is one recipe that baking just doesn't do justice. everything in moderation, right? wonton wrappers are a great item to have in your freezer for a quick appetizer, garnish or even as a fresh pasta substitute. try baking or frying them with just a little olive oil and sea salt and breaking into pieces for a crunchy salad garnish. or fill them with fresh herbs and cheese, boil and toss with a little marinara for a quick pasta dish. or of course, fried wontons - our take on a traditional chinese take out favorite! in a small bowl, combine crab meat, goat cheese, green onion and old bay. stir with a fork to break up crab and evenly combine. lay out wonton wrappers and fill each with a heaping teaspoon full of filling. brush two of the four edges with water and bring unbrushed edges over filling to seal tightly. repeat with remaining wontons. heat about 1/4-inch deep amount of oil in a skillet over medium high heat. carefully fry wontons for about 4 minutes per side or until golden brown and crispy. drain on a paper towel. serve immediately with a little soy sauce for dipping. enjoy! oh deliciousness! what a great idea. 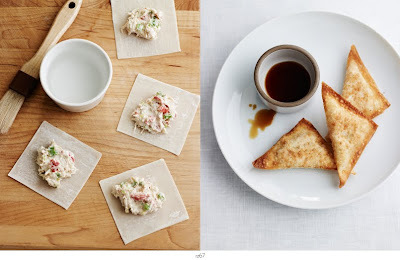 Oh my goodness, two of my favorites things: goat cheese and wontons. My stomach ingrumbling here! Goat cheese and crab together? Heck yes! Those would make for some unctuously good wontons! Great idea! did not know that you could use so little oil to fry these. assumed they had to be deep fried. to the grocer i go, in search of frozen wonton wrappers! I never liked those crab & cream cheese-filled wontons every Chinese restaurant seems to serve. But with goat cheese??? You might have changed my mind. Now to adapt to gluten-free . . . I don't read Goop, but other blogs that I DO read were 'Gooped,' and I followed the links to you! So glad I did - I love your photography and styling! Good fried food is always welcome every once in a while - we no longer keep our deep fryer in our kitchen, because we think "what can we fry next?" Yum - I love goat cheese - definitely going to put this on my list of things to make! Hm they look delicious! I really like your photography! These seem so elegant in flavor and so simple to execute. These would be great to entertain with! Oh dear, my husband is going to LOVE this. Thank you!